No matter which shipping carrier you use, they have developed packing strategies to maximize their capacity and ultimately their revenue. One of the techniques carriers have is to measure dimensional weight to make the most out of lightweight items that occupy more space. 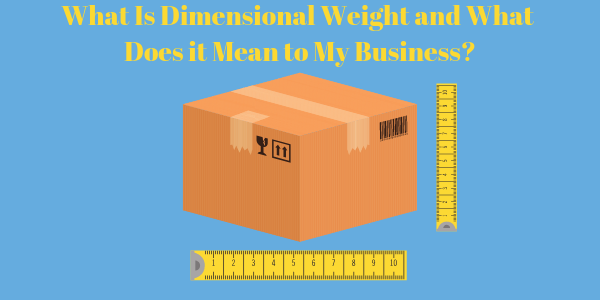 In this post, we’ll explain everything you need to know about dimensional weight, how it’s calculated, why it matters for your product management, and best of all, how you can avoid it (or at least help you to reduce it). In shipping, not all weight is necessarily created equal. What you consider in your mind to be soft and light could conceivably take up a lot of space in a shipment. That might hinder carriers from shipping it with other products at the same time. To put it simply: It costs more to move a truck full of down blankets than one filled with headphones. The blankets take up more space, they cost less, and it would take more shipments for the carriers to make a large enough profit to make it worth it. That being said, dimensional weight, also known as volumetric weight, DIM weight, or cubed weight, is a pricing technique used by shipping companies to ensure that they don’t lose money on large, lightweight shipments (like a truck full of blankets). Dimensional weight is calculated with a formula using the volume weight of a package based on the dimensions of the box. While physical weight is the weight of the shipment according to the scale, dimensional weight is calculated based on the package’s length, width, and height. As a result, that oversized boxful of blankets might be considered heavier than a box of headphones. Dimensional weight takes the cubic volume of a package then divides that by the shipping factor (whether international, domestic, or other less common factors). Here’s an example: You have a box measuring 48 inches x 20 inches x 20 inches. If the three dimensions are multiplied—48 x 20 x 20—it equals 19,200 cubic inches, which is the cubic volume of that package. Carriers like FedEx, UPS, and DHL Express take that number and divide it by the rates for their shipping—different types of shipping will incur a different division number. The carriers just listed will use 139 in / lb for domestic rates, and FedEx SmartPost and DHL will use 166 in / lb as the dimensional factor for international shipments. Dimensional weight calculations can vary depending on the carrier, the shipment, the journey of the package and more. If you ship our example box domestically, the dimensional weight equals 10,240 divided by 139 — 73.67lbs. Can I avoid the cost of dimensional weight? Package your products with as little extra room as possible. Third-party-logistics (3PL) companies that help sellers manage their shipments often provide packaging services to maximize the space and reduce shipping costs. Commonly they’ll remove a product from its original box then repackage it to better utilize the space. Opt for an alternative service that has lower dimensional weight pricing. What shouldn’t be overlooked, though, is that dimensional weight is a necessity. It helps freight companies maintain their stellar service by organizing and economizing their services. Dimensional weight ensures a fair charge for sellers shipping large but very light items that take up more space than a tiny but very heavy package. If you are looking for a 3PL to help you understand concepts like dimensional shipping or require logistics support we’d love to hear from you. You can read DCL’s list of services to learn more, or check out the many companies we work with to ensure great logistics support. Send us a note to connect about how we can help your company grow.